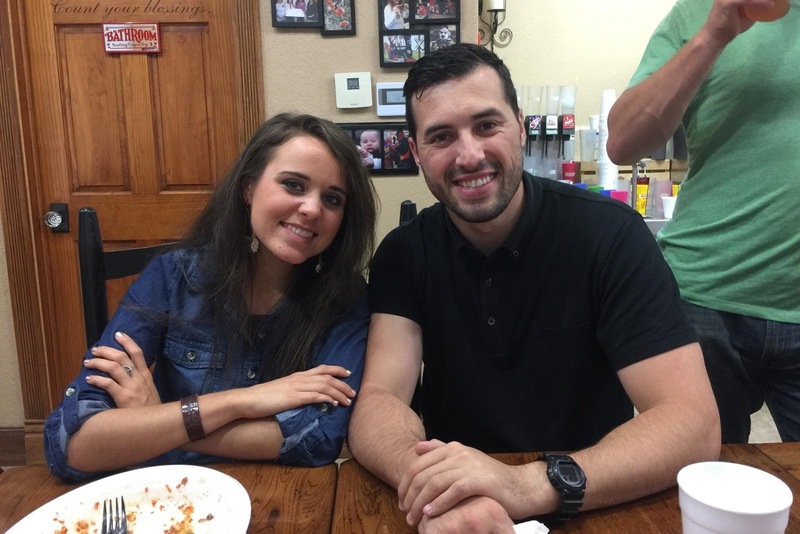 We know you are all eager to see photos of Jinger and her boyfriend, so we have a couple to share. For the full album, visit duggarfamily.com. These photos are property of duggarfamily.com and may not be used without written permission. I'm surprised that Jessa and Ben didn't introduce Jeremy to Jana since there wouldn't be such a big age difference. But I'm still happy for Jinger. I think it's less about age and more about who would be a better match with the guy. Don't you think personalities that suit each other are a little more important? Might have been that Jeremy and Jana aren't a great match. Jana has said in past episodes she would like a husband she can work along side with as well as live more in the country. Age is really not the most important thing to consider in a relationship. Since Ben and Jessa know all of the people involved, they obviously felt that Jinger and Ben would be compatible. It's not like they wanted to find him a wife and one sister or the other was the same! I don't know what idea you have of love but it doesn't work like that... Ben and Jessa probably introduced him to the whole family and he and Jinger hit it off. I am very happy for them. I'd say that probably introduced Jinger to Jeremy due to her personality. I almost thought the same thing, but then I remembered in one episode, that Jana said she would like to marry a man that works with his hands so she could help him. I'm sure he met Jana as well, but that doesn't mean they were right for each other. Maybe he expressed an express interest in Jinger. These two seem a perfect match! Jeremy must have expressed his expresso interest in Jinger! He's a professional soccer player? I thought he was a minister. He used to be a soccer player but retired to be a minister. He was a soccer player and gave it up to become a minister at a small church. He was a professional soccer player and now he's a minister. If you read the information he was a pro soccer player. He's now a minister in Texas. He is now, but he used to be a pro soccer player. It's misleading, he's and ex-pro player. Awww. They look so cute together!!! I hope they get married!!! Im happy for them but honestly, why is he not interested in Jana? Is it because she's older? Why does she keep getting passed over? That's exactly what I wondered right away too! Jana has said her self that she wants someone who works outdoors and with his hands. I don't think it's that she got passed over. He just may not have been her type. Maybe he has more in common with Jinger than Jana. It's not about age, it's about feelings. Maybe their personalities don't match. Why is anyone interested in anyone? They're two different people. Not being romantically pursued by every man in the vicinity is not "getting passed over." I bet Jana loves being single. She probably just wishes she was allowed to move out and live her own life like a real adult! It's not like the Duggar girls are all carbon copies of each other and suitors just choose the one closest to their age. If that was the case, Ben should have ended up with Joy Anna. They're unique individuals with different personalities and guys are interested in them for more than their age. I'm really astonished at the idea of love and relationships some people have. It's not like when he entered the Duggar house was looking for a wife and wanted to evaluate the sisters! He just met them and he and Jinger felt attracted to each other's heart. It's spontaneous, guys, it's not like an examination of which sister would be better. I think because of their personalities he and Jinger went together better. He was introduced to Jinger. I don't think it's because Jana is older. Personalities have to go together. Jana is a sweetheart & I'm sure God has someone special for her. He's been friends with Ben. Before he & Jinger met. Plus Jessa & Jinger are very close. I'm sure if it was Jana he was interested in, Ben & Jessa, would have introduced him to Jana. Just because she's older doesn't mean she's more right for him! All the Duggars have different personalities and they don't have to get married in any certain order. That's not how it works in the love department. Kinda covetous to be making these kind of comments, I think. Is that not Jinger's man now? Who says Jana is "being passed over" Perhaps she is focusing on her career and travelling the world. Not uncommon for someone of her age. If he's interested and attracted to Jinger, then that's who he's attracted to! Jana is not getting passed up. Shes not a pick in a litter. She'll find whats a perfact match and Gods will. There is no order. Thank you for sharing. Just a sweet couple. Many prayers and blessings for your relationship and future together. Jinger, I am so excited for you; I believe you have chosen well. Wishing you and Jeremy happiness; peace and joy always! lets get this straight he is not a soccer player any longer? ok? tell the truth? not half truth. and tell the diggers let the daughter have privacy with her boyfriend she is old enough to make good decisions. I hope she just up & elopes with him - go Jinger go - but I know they'll have to have another Made for TV Wedding with all that involves, including the extensive guest list and matching registry list. If she takes the same time frames as Jill she will marry before Valentines Day of 2017. Would they have a shorter courtship and be engaged and marry for a Christmas wedding? Yes, sadly, the timing is just a little bit too convenient isn't it? So sorry for these kids, they have no understanding of privacy. Most of all I wish them to take the time to get to know each other. I hope Jim Bob can pronounce that guy's last name & doesn't go on TV with some other version of it. After attending Syracuse University, Jeremy, who is 28 years old, played professional soccer for the New York Red Bulls and the San Antonio Scorpions. He recently stepped away from athletics to enter full-time ministry and is currently serving as the pastor at a small church in Laredo, Texas. O,M,goodness. I wish that was my situation. Congrats Jinger! Hoping for only the best for you and Jeremy! Why do the Duggars always have to be "introduced" or "set up??" Just let your adult children go out into the world and meet their potential spouses naturally. I love love loved it when the eldest Bates son met his wife Whitney at a burger place! I would never EVER have let my parents be in on my decision about a spouse. Not the picking, not the introduction, not the dating, not the communication, not anything. They don't have to live with him, I do! All they had to do was set a good example for me and trust me to try for a similar marriage, totally on my own. Which, I am happy to report, worked out well. Imagine that, Jim Bob. It can be done. From my understanding, Jessa and Ben introduced Jinger to Jeremy. So, Jim Bob DIDN'T do the "picking" and "introduction". It's always important to have the facts straight, especially if you decide to judge someone. Come on now why do they need to share their life pictures with strangers. This should be private not expolited. What happen to their morals? You do know that the purpose of this blog is to report news and pictures about happening in the Duggar family right? And since you're here reading this blog it seems as if you're interested in that news. Why is there a problem? He looks kind of old for her. It's the same age difference my grandparents have. Finding your spouse isn't a matter of numbers, it's a matter of love, of common vision of life and respect. I'm 6 years younger than my husband. We have been together for 10 years now. I was 19 and he was 25 when we met. Why is Michelle wearing a maternity top? She's wearing a long tunic with a belt...Probably because she likes it and it's comfortable. I bet it was hard for Jeremy all those years at college and playing soccer to remain pure and chaperoned with women. He wasn't...he has admitted he was a party animal. He definitely comes from a much different background than any of the other Duggar spouses. Great news!! I hope that this will continue to progress and we will see a wedding soon. Family is changing and it such an exciting adventure. They look a lot alike, their kids would look like both of them in a really cute way!! God bless them!!! He's from Philly, so the boys should be careful during football season, since half of them root for the Cowgirls. He is turning Jinger into an EAGLES fan. I'll bet TLC was holding their breath until another Duggar courtship came along to save their sinking programming ship! Cameras rolling again and all is safe in Duggarville. All right that's enough everyone. This is their relationship. I wouldn't want anyone judging my relationship. Just give them their congrats and leave them alone. Geezs. 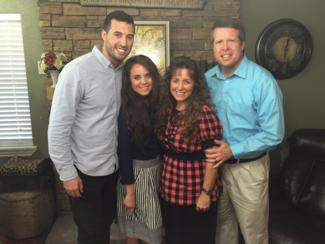 Happy for Jinger..Perhaps she can move to Texas! On a side note, does Jim Bob EVER take a picture with Michelle that he doesn't have his hand on her arm like "stay right there"
I think that is REALLY reading into a harmless situation. I SOOO agree with you to June 24 @ 6:39PM! That is so him to do this in EVERY picture with her, makes a person wonder if its a self esteem issue with him?! Very handsome. He looks very manly. I am so happy for both Jeremy and Jinger. I think this will be a great match, because they chose each other...or God chose them for each other. It's a good match. Prayers going up for this courtship. Jinger I am so happy for you. I have to commend JimBob for not allowing the fellow's past indiscretions get in the way of what might be a good match or relationship. I am, however, curious about Jeremy's tattoo, which appears to have been photoshopped out of the picture (right upper arm) or I wonder if it was removed; I'd be surprised if her father would be okay with it, even if it's religious or a verse. Interesting to me. I'm happy for them and hope they are able to grow closer. I'm not worried about Jana not being married anymore than she is. It will be private and right for her when announced. She may seem meek but she is a very intelligent strong woman that will meet her match when it's time. I'm very impressed of her conviction and clear focus. Always great to see that in today's world. Does anyone know what jeremy's tattoo says?? ?